On 3 September 1914 the Admiralty was put in charge of the defence of the United Kingdom against air attack. Its strategy was to use its limited number of aircraft in attacks on airship bases rather than on defensive patrols. A seaplane carrier raid was launched against the airship base near Cuxhaven on 25 December 1914. An attack on the Emden base was planned, but was postponed on 14 January 1915 because the weather was unsuitable for seaplanes. Night attacks were expected in 1914, so some restrictions on lighting were introduced in London, Birmingham and coastal towns. These did not entail a full blackout because of the potential effect on road safety and business. Major thoroughfares and bridges had their lighting broken up and parks were given lights in order to stop enemy airmen using them to find their targets. Lights on public transport were reduced to the minimum and ones in shops shaded. A Naval Corps of Anti-Aircraft Volunteers was established to man anti-aircraft guns, with recruitment starting on 9 October. However, there were so few guns that only London, Dover and Sheffield could be defended at first. The dockyards were so busy that it was decided that their lights would be put out only when a raid had been detected. The first German air raids were carried out by aircraft. One dropped two bombs into the sea off Dover on 21 December. Three days later another dropped the first aerial bomb to land on British soil, also on Dover. The only damage was broken glass. Another aircraft appeared the next day. It was attacked by British anti-aircraft guns and pursued by three aircraft, but it ecaped. The German navy had discussed using its airships to attack the UK in September 1914, but had decided that it did not then have enough Zeppelin airships to do so whilst carrying out the more important task of fleet reconnaissance. By 7 January 1915 it had 12 airships, and Admiral Friedrich von Ingenohl, the Commander-in-Chief of the High Seas Fleet, decided that four could be used to bomb the UK. The long nights of January and February were thought to be particularly suitable for airship raids. There was also a desire to act before the British repeated their raid on the airship sheds. The first date on which the weather was suitable was 19 January. Three Zeppelins set off between 9:00 am and 11:00 am. L6 (Oberleutnant Freiherr von Buttlar) had to turn back because of engine problems, but L3 (Kapitänleutnant Hans Fritz) and L4 (Kapitänleutnant Graf von Platen) arrived over the east coast of England at 8:00 pm. Their target was Great Yarmouth. The authors of the British Naval Staff Memorandum note that it ‘seemed to exercise a curious fascination over the minds of those planning raids in Germany…in preference to more valuable objectives.’ It had been the target of a raid by surface ships on 3 November 1914. It was a defended port, so was a military target, but not an important one, so was most likely chosen for geographical rather than military reasons. L3 crossed the coast at Winterton and turned south towards Yarmouth. Fritz reported being fired upon by anti-aircraft guns on the north side of the town, and dropped six 110 pound explosive and seven incendiary bombs from 4,900 feet. He then headed home, crossing the English coast at 8:27 pm and reaching Fühlsbüttel at 9:00 am on 20 January. L4 made a navigational error and found herself over the small town of Sheringham around 8:35 pm. Von Platen dropped two bombs on it, before heading west and dropping one bomb on each of the villages of Thornham, Brancaster, Hunstanton, Heacham and Snettisham, He stated that his airship then found itself over a large town at a height of 820 feet. It was caught in searchlights and came under fire, so he dropped seven 110 pound explosive and one incendiary bombs. The town was King’s Lynn. It is difficult to see why an internal document, intended only for the use of RN officers and written in 1925, would lie, so it would appear that the Germans imagined the anti-aircraft fire. Four British civilians were killed in the raid. Samuel Smith, the first person in Britain to be killed by aerial bombardment, and Martha Taylor in Yarmouth and 14 year old Percy Goate and Alice Gazely, a 26 year old war widow, in King’s Lynn. Three were injured in Yarmouth and 13 in King’s Lynn. This link includes pictures of the damage. It is widely claimed, including by the Daily Mail and Gorleston & Great Yarmouth History websites linked in the previous paragraph, that the Kaiser forbade attacks on London because he did not want to risk injuring his relatives in the British Royal Family. However, this website notes that L4 flew over Sandringham, one of the Royal Family’s houses, leading to allegations at the time that it was a target of the raid, which it was not. Naval Staff Monograph (Historical) vol. xii, Home Waters part iii, November 1914 to the end of January 1915. pp. 173-74. Ibid., pp. 174-75; W. A. Raleigh, H. A. Jones, The War in the Air: Being the Story of the Part Played in the Great War by the Royal Air Force, 7 vols. (Oxford: Clarendon Press, 1922). vol. iii, p. 83-86. Raleigh, Jones, War in the Air, p. 89. Naval Staff vol. Xii. p. 175. Quoted in Ibid., p. 176. There are some differences in times and number of bombs dropped in various sources. The ones quoted here are from Ibid., pp. 176-77. Negotiations between the United Kingdom and the United States to end the War of 1812 began in Ghent in late August 1814. A peace treaty was signed on 24 December and ratified by the British government three days later. However, the slow speed of communications in those days meant that it took some time until the news reached the USA. Fighting therefore continued for nearly two months. In December 1814 10,000 British troops landed near New Orleans. They were commanded by Sir Edward Pakenham, like most of his men a veteran of the Peninsular War. The advance guard under Major General John Keane camped nine miles from New Orleans at noon on 23 December. By the early evening his initial 1,900 men had been joined by another 400. Andrew Jackson, who had been in command of the defences for only three weeks, decided to strike the first blow. He attacked Keane with a force of just over 2,000 after dark on 23 December. The British troops were more experienced as well as more numerous. They could possibly claim a tactical victory as they held their ground, albeit at the expense of nearly 300 casualties versus over 200 American. The latter withdrew three miles. However, the action was a strategic success for the Americans, who halted the British advance for long enough to erect a series of breastworks, defended by 3,000 men, with their flank protected by the corvette USS Louisiana in the Mississippi. Pakenham advanced to the breastwork on Christmas Day. He then halted for three days, before launching a series of probing assaults. Heavy British guns were brought up, with the intention of attacking on 1 January. However, the Americans had the better of the pre-attack artillery duel, so Pakenham cancelled the assault. The next attack was to take place on 8 January. A canal would be dug to take 1,500 men under Colonel William Thornton to the Mississippi in ship’s boats. They would then cross the river and assault a redoubt that had been established on the west bank with three 24 pounders and six 12 pounders, which could fire into the flank of the attack by the other 8,500 men on the east bank. The official US returns stated that there were initially 4,698 men on the east bank and 546 on the west. Another 500 men were ordered by Jackson the reinforce the latter, but 100 did not arrive in time and only 250 of the others were armed. This gives a total of 5,494 Americans at the battle, but Theodore Roosevelt notes that there may be a double counting of the 500 sent to the west bank, reducing Jackson’s force to about 5,000. The sounds of the British preparation alerted Jackson the impending assault, so his men were on the alert before dawn. The British attackers on the east bank were initially protected by a fog, but it lifted when they were 400 yards from the American defences. The sides of the canal that was intended to take Thornton’s force to the river caved in, with the result that it was late in setting off and only 700 men crossed. They landed in the wrong place, but were able to take their objective. Jackson organised a counter attack, but the British withdrew before it went in as Colonel Alexander Dickson, the British artillery commander, estimated that 2,000 men would be needed to hold the position. By then, the main British attack had been repulsed with heavy casualties. Pakenham, his second in command Major General Sir Samuel Gibbs being killed. Keane was wounded, leaving Major General Sir John Lambert, the only uninjured British general present, in command. Gibbs, Keane and Lambert had all been knighted on 2 January. Wikipedia gives British casualties as being 2,042: 291 killed, 1,267 wounded and 484 captured or missing. American ones were 71: 13 dead, 39 wounded and 19 missing. The two armies then faced each other for 10 days. The position was too strong for the British to take, especially as Jackson was receiving reinforcements. However, he was unwilling to attack, since the British troops were more experienced than the Americans, so would have an advantage fighting in the open. Lambert retreated his force on 18 January. It re-embarked on its transport ships and headed for Mobile. On 8 February 1,500 men were landed at Fort Boyer, which surrendered with the honours of wars on 12 February, a few hours before the news of the end of the war arrived. Casualties were 11 Americans and 31 British. New Orleans was a major US victory that saved the city and Louisiana from being devastated. As Americans learnt of it before they heard about the end of the war, it was natural for them to assume that it won them the war. However, this was not the case as peace terms had already been agreed. Jackson, the architect of the victory, was rightly regarded as the best American general of the war and later became President. Ibid., p. 238. Note 2. Previous entries in this blog have dealt with the several sinkings of British cruisers by German U-boats: HMS Pathfinder by U21 on 5 September 1914, HMS Aboukir, Cressy and Hogue by U9 on 22 September and HMS Hawke on 15 October 1914, also by U9. British submarines also scored successes in the early stages of the war, with E9 sinking the German cruiser SMS Hela on 13 September and B11 the Ottoman pre-dreadnought battleship Mesudiye on 13 December 1914. The first loss of a submarine to a warship had come as early as 9 August, when HMS Birmingham rammed and sunk U15. The main impact of submarines in the rest of the war and in the Second World War was against merchant shipping, although they continued to sink warships. In the early stages of the First World War, however, they were used mainly against warships. The rules of cruiser warfare required raiders to stop and search enemy merchant ships. They could be sunk or captured only if their cargoes contained either war materials (absolute contraband) or items such as food or fuel that had peaceful uses but were intended for the enemy’s military (conditional contraband conditional contraband). The safety of the crews of merchant ships that were sunk had to be ensured, making it difficult for submarines to conduct war against merchant shipping within the rules. They had no space for prisoners and no spare men to act as prize crews for captured ships. In 1914 Germany possessed only 24 operational boats. Four were used for training and 16 were under construction. Before the war Kapitänleutnant Blum of the German Navy had estimated that 222 U-boats would be needed to successfully carry out a war against British commerce under international law. On 8 October 1914 the commander of Germany’s U-boats, Korvettenkapitän Hermann Bauer, urged that German U-boats should attack British commerce on the grounds that the British had already violated international law at sea, but his advice was not acted upon until 1915. The first sinking of a merchant ship by a submarine came on 20 October, when Oberleutnant Johannes Feldkirchner’s U17 stopped the steamship Glitra, which was carrying a cargo of coal, coke, oil and general goods from Grangemouth to Stavanger, 14 miles off the Norwegian coast. The crew were ordered to take to their boats and their ship was sunk. U17 towed the boats towards the coast, before a pilot boat then took over. A Norwegian torpedo boat appeared shortly afterwards. There were few sinkings of merchant ships in 1914. On 26 October, Kapitänleutnant Rudolf Schneider’s U24 torpedoed the 4,590 ton French steamer Amiral Ganteaume, but she did not sink. She was carrying 2,500 Belgian refugees, 40 of whom were killed. This was described as ‘barbarous’, an ‘outrage’ and an ‘atrocity’ by British post war authors. However, Schneider may have thought that she was a troop ship. Whether he did or not, the incident showed the potential political and diplomatic implications of submarine warfare against merchant shipping. The Naval Staff Monograph argues that he fired without ascertaining whether the people crowding her decks were civilians or soldiers. Only two more Allied merchant ships were sunk by U-boats before the end of the year. Oberleutnant Otto Hersing’s U21 stopped the steamers Malachite (718 tons) on 21 October and Primo (1366 tons) five days later. Both were sunk by gunfire after the crews had been given time to abandon ship. The most important actions of U-boats continued to be against warships. Both sides had submarines patrolling outside enemy bases and their own boats hunting the enemy ones. On 18 October Kapitänleutnant Bernd Wegener’s U27 spotted the British submarine E3 on the surface in the Helgoland Bight. The submerged German boat approached to within 300 yards of the British one, using the rays of the sun to make it hard for the British to spot her periscope. The personnel on the conning tower were apparently all looking the other way. U27 then fired a torpedo into E3, which sank immediately. Four survivors were spotted in the water, but Wegener did not surface, fearing that there might be other British submarines nearby, and all 28 men on board E3 were lost. She was the first submarine ever to be sunk by another submarine. U27 achieved another first 13 days later, when she sank the elderly cruiser HMS Hermes, which had been converted to a seaplane carrier before the war, and was being used as a aircraft transport. This was the first sinking of an aviation ship by a submarine. The quick arrival of other British ships meant that only 21 men were lost. Apart from E3, the British Empire lost two submarines in 1914: the Australian AE2, probably to an accident, off Rabaul on 14 September; and D3 to a mine, probably British, during the Yarmouth Raid on 3 November. 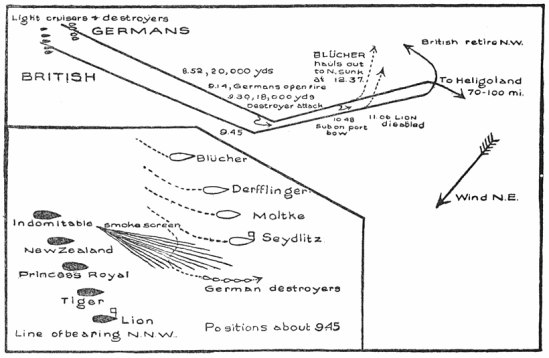 The German lost four boats in addition to U15 in 1914: U18 was rammed by first the trawler Dorothy Gray and then the destroyer Garry inside Scapa Flow on 23 November and was so badly damaged that she had to be scuttled; U13 in August and U5 and U11 in December failed to return from patrols, presumably having struck mines. The ships sunk by submarines in the North Sea were mostly old. The only dreadnought to be torpedoed by a submarine in 1914 was the French Jean Bart, which was damaged, but not sunk, by the Austro-Hungarian boat U12 in the Adriatic on 21 December. V. E. Tarrant, The U-Boat Offensive, 1914-1945 (London: Arms and Armour, 1989), p. 7. P. G. Halpern, A Naval History of World War I (London: UCL Press, 1994), p. 291. Naval Staff Monograph (Historical) vol. xi, Home Waters part ii, September and October 1914. p. 113. gives Glitra’s displacement as being 526 tons but most others sources follow the official history in saying 866 tons; C. E. Fayle, Seaborne Trade., 3 vols. (London: HMSO, 1920). vol. i, p. 285. A. S. Hurd, The Merchant Navy, 3 vols. (London: HMSO, 1921). vol. i, p. 268. Fayle, Seaborne. vol. i, p. 285. R. H. Gibson, M. Prendergast, The German Submarine War, 1914-1918. (London: Constable, 1931), p. 15. Naval Staff vol. Xi. p. 144. Gibson, Prendergast, German, p. 17.